This is a great topic. Not easy. Maybe you can nominate one band. I offer my nomination. They don't have the highest album sales, but are close. For me, this band represents the finest that America has ever done. Soulful hits, extreme talent, unique artistry, worldwide appeal, positive vibrations, american melting pot at its highest ideal. The ol' U S of A. No Rush, Queen, Zep etc. Larry , who is that? Best American band was mostly Canadian, why of course The Band! Tuolumne Tradster. You're a man of my tastes with that nomination. The Allmans tied for #2 for me with Skynyrd. The Allman's are better but I couldn't bet against Freebird. And my roots are in Bama. The answers show a regional preference I think. Mine do. "Larry , who is that?" Loverboy. Ron's got their poster on his ceiling. Flip Flop: I'm a Cali native, so Allman Bros is not a regional preference for me. I just luved the hard drivin' double drummers and incredible guitar playing by Duane & Dickey Betts. Saw them live at Fillmore SF in 1971. Believe it or not, they were not the top bill that night...Mark Almond Band was. In memory of Elizabeth Reed, Blue Sky, and Whippin' Post to name a few of my favorite tunes. Here's a local SF Bay Area band that I listened to in my formative years. Anybody remember these guys? Has everyone forgotten about a dude named Hendrix? 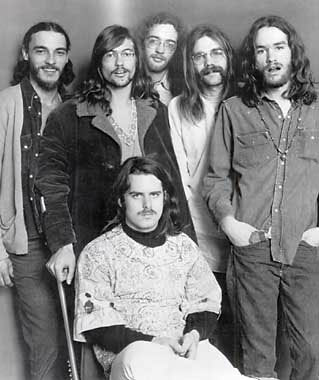 Apart from him there's CCR, the Eagles. Aerosmith was solid early then descended into deep schmalz. While Hendrix was born in Seattle, he the Experience was from England. But Band of Gypsies was, of course, all American. Picking the best band is kinda like picking the best rock climber--I've seen a bunch of bands hit "10." Some folks are gonna say Michael Jackson, others will say The Grateful Dead. Is anybody right, or wrong? But those guys, well they're dead. So how about something we can act upon, like Your Favorite Current American Rock Band. One of the best shows I've seen was Lucinda Williams. The best American Band is the one having the most fun. Though Primus is up there. The best American rock bands that I'm aware of are the pegmatite dikes in the Black Canyon. Usually spicy gear there that keeps you focused.